Arianespace opened their 2019 mission activity by successfully orbiting a pair of telecommunications spacecraft — Saudi Geostationary Satellite 1/Hellas Sat 4 (HS-4/SGS-1) and GSAT-31 — using the company’s workhorse Ariane 5 launch vehicle. 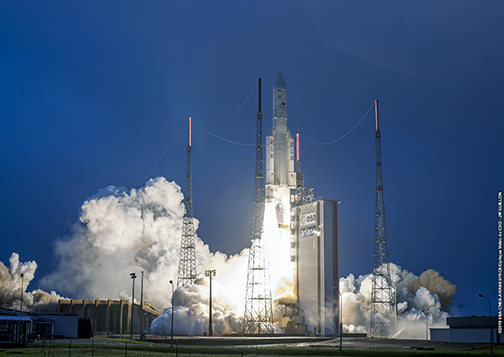 A successful performance by an Arianespace Ariane 5 ECA launch vehicle for Flight VA247. Photo is courtesy of Arianespace. This flight to geostationary orbit, performed from the Spaceport in French Guiana, delivered a payload lift performance estimated at 10,018 kg. — which included the two spacecraft, along with the dispenser system and integration hardware in Ariane 5’s dual-passenger configuration. Deployed first in the flight sequence 27 minutes after liftoff, HS-4/SGS-1 is a geostationary “condosat” for Saudi Arabia’s King Abdulaziz City for Science and Technology (KACST) and Greek-Cypriot satellite operator Hellas Sat, an Arabsat subsidiary. Designed, assembled and integrated by Lockheed Martin Space, HS-4/SGS-1 will operate from an orbital position of 39 degrees East, with a coverage area that includes Europe, South Africa and the Middle East. 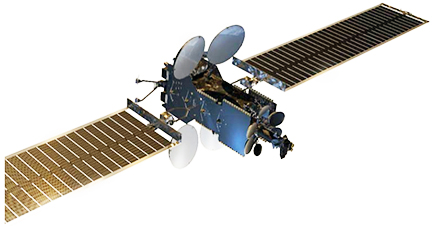 Saudi Geostationary Satellite 1/Hellas Sat 4 satellite. GSAT-31 was carried in Ariane 5’s lower payload position and released second in the sequence for today’s mission, which is designated Flight VA247 in Arianespace’s numbering system — representing the 247th launch of an Ariane-series launch vehicle. 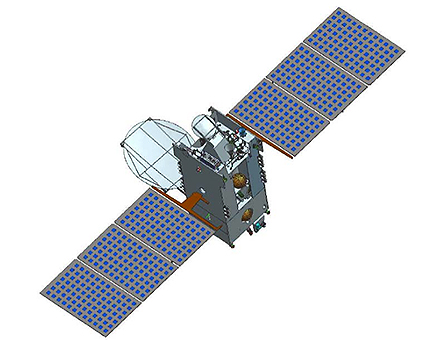 Artistic rendition of the ISRO's GSAT-31 satellite. The spacecraft was designed and manufactured by the Indian Space Research Organisation (ISRO) and will provide Ku-band communications services from an orbital slot at 48 degrees East, helping “bridge the digital divide” with coverage across the Indian subcontinent. Arianespace CEO Israël noted that GSAT-31 was the 23rd ISRO satellite orbited by Arianespace and Ariane-series launchers, tracing the relationship back to India’s APPLE small experimental communications spacecraft, lofted in 1981 by an Ariane 1 version. With today’s success, Arianespace kicks off a busy launch schedule in 2019 — which targets up to 12 missions from the Spaceport with the heavyweight Ariane 5, medium-lift Soyuz and lightweight Vega. Arianespace CEO Stéphane Israël confirmed the success in post-launch comments from the Spaceport’s Jupiter control room. “For the first Ariane 5 launch of the year, our heavyweight vehicle has once more performed flawlessly,” he said. “Congratulations to all. Arianespace is honored ISRO has entrusted Ariane 5 for two launches back-to-back, with the last Ariane 5 of 2018 launching GSAT-11, and this first one of the year 2019, which orbited GSAT-31.